Comments: Evergreen broadleaf native to Malaysia and Indonesia. Dark green 4" oval leaves and gray-white bark. 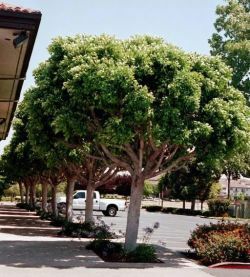 Mature trees to 50' with moderate spreading. Like other ficus species, trees can have aerial roots. Also known as Ficus Microcarpa.